Lester Holt speaks on stage at an event at The Waldorf Astoria Hotel on Sept. 12 in New York City. Monday night's debate between Hillary Clinton and Donald Trump will be the first time the two square off directly during this general election campaign. At such moments, the stakes are invariably characterized as high for the candidates, their presidential prospects on the brink of success or ruin. Or maybe not. As the Dartmouth College political scientist Brendan Nyhan recently wrote in the Columbia Journalism Review, "political science research suggests that [debates] rarely cause a significant change in the polls." 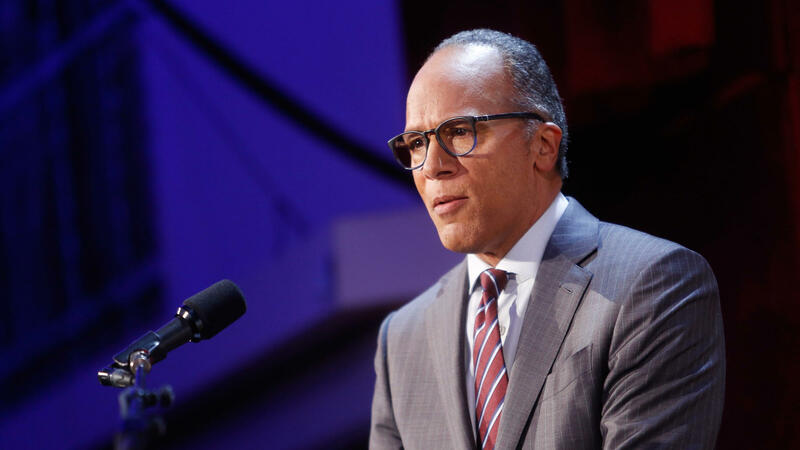 Here's someone to whom Monday's event will matter a lot: moderator Lester Holt, the lead anchor for NBC Nightly News and the third person on that stage at Hofstra University in Long Island. Holt is something of the accidental anchor. He ascended to the top role last year after Brian Williams' self-inflicted career sabotage, when Williams was found to have spun inflated tales of the perils he faced reporting in Iraq and New Orleans. Holt has been the dependable Mr. Everything for NBC News: the host of Dateline NBC, former co-host of the weekend Today show, the longtime anchor of the weekend edition of NBC Nightly News. But Williams is two months younger than Holt — a transition from the former to the latter simply was not envisioned. While Holt did moderate a primary debate this spring, Monday's will be his first presidential debate, and the context and the nature of these events are different. All of the major networks and cable news channels will broadcast them. Tens of millions of Americans will tune in. It will be the first time for those who follow, as well: Anderson Cooper of CNN, Martha Raddatz of ABC News and Chris Wallace of Fox News. Elaine Quijano, a CBS News correspondent and anchor of CBS's digital news channel, will moderate the vice presidential debate early next month. Holt will also be carrying institutional baggage. Matt Lauer of NBC's Today show caused much angst for colleagues when he hosted a town hall discussion with both candidates on national security issues earlier this month; he spent so much time pressing Hillary Clinton for answers about her email server that he had to rush her for answers on questions requiring more depth. Meanwhile, Lauer failed twice at even the most basic level of fact-checking as Trump asserted, without a trace of evidence or shame, that he had openly opposed the invasion of Iraq before the U.S. and its allies sent in troops in 2003. As BuzzFeed and others pointed out, he had said the opposite on the Howard Stern show in late 2002. Trump pointed to a 2004 article in Esquire for validation. Had Lauer been present in the moment, he would have perked up at the date of that article, which Trump cited. The interview took place more than a year after the invasion, and after much public opinion had shifted against the war. It did nothing to prove Trump's assertion. Clinton has been all but silent about the debates and about Holt in particular. Her aides, however, have ramped up pressure for moderators to scrutinize the truth of the two candidates' statements — knowing Trump's penchant for saying things that are not simply offensive but untrue. Not calling out false statements would give Trump an "unfair advantage," Clinton's communications director, Jennifer Palmieri, told reporters in a conference call on Friday. Holt himself has kept mum. Additionally, Trump sought to pre-empt any effort by Holt to hold candidates accountable for what they say on stage as unfair and partisan. As Maggie Haberman of the New York Times tweeted on Saturday, "All pols embellish and bend facts, including Clinton. Trump's are in a different category." Around such challenges are waged battles both journalistic and ideological. Trump this month unfavorably invoked the example of Candy Crowley, then with CNN, who moderated one of the presidential debates in the 2012 cycle. She stepped in when former Gov. Mitt Romney said President Obama had failed for two weeks to call the attack on the American diplomatic compound in Benghazi a terrorist act. Crowley rightly pointed out that Obama had called it an act of terror in his remarks the next day, though Obama and other White House officials were not consistent in their subsequent characterizations. Crowley's extended back-and-forth with Romney, who did not want to concede the point, influenced the tenor and rhythm of that debate, much to the chagrin of the GOP. So pro-Trump Republicans (and some others) say fact-checking is unfair, designed to enable moderators to make a name for themselves at the expense of those on the ballot. Retired PBS anchor Jim Lehrer, a frequent moderator, says he was there to help the candidates advance their own arguments and rebuttals. Fox's Chris Wallace, no stranger to a tough question, says he does not intend to perform that role. PBS's Gwen Ifill, a veteran of such duties, recently wrote that she believes moderators often need to step out of the way. But she added that "it is the moderator's responsibility to anticipate the [answers] well enough to add clarity if it is needed." And this is the central rub. No one votes, as Ifill points out, for moderators. And debates are spectacles, usually joint appearances by candidates rather than true debates. Yet insights and newsworthy moments emerge. Surely an anchor such as Lester Holt does not abdicate his duties as a truth-seeker and a journalist by serving as a debate moderator. Nor are such events a showcase for moderators to prove their likeability or cleverness. They need to pick their spots and serve their viewers — and our nation's voters. These are the treacherous waters that Holt — and the subsequent moderators — have to navigate as they have to contend with the most disruptive presence in a presidential election in decades.